U.S. President Donald Trump has a “big ego” but he is “more honest” than former President Barack Obama, Beijing residents told the independently run South China Morning Post in a Nov. 8 feature. While independent, media analysts say the South China Morning Post often echoes the Chinese government-run media. Chinese citizens are generally expected to toe the official Chinese Communist Party line. The Xi Jinping regime has undertaken increased efforts to contain free speech on the Internet by introducing cyber-security laws designed to crack down on any political dissent taking place online. 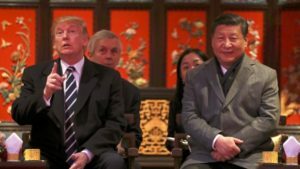 Chinese propaganda outlets such as the People’s Daily and Global Times have written positive editorials about Trump’s first visit to China, which began on Nov. 8. “In realizing the denuclearization of the Korean Peninsula, and protecting peace and stability on the Korean Peninsula, China and the United States have common interests,” an editorial in People’s Daily stated. The Chinese government uses its state media to often claim that the West is in a state of “chaos,” as opposed to the “stability” of communist China.